We have provided reporting support for multiple Epic deployments. Too many business intelligence projects fail because they get stuck in the implementation phase for too long. Emphasis is placed on "building" versus "using" analytics. Syntrix's proprietary healthcare business intelligence system, Smart Medtrix™, offers pre-built healthcare dashboards that let you start analyzing your clinical and financial operations without delay. You can further build custom components as needed using an agile development approach. Our healthcare dashboards will let you keep an eye on the big picture while focusing on what matters most. Monitoring trends and tracking key performance indicators often lead to the need to delve further into specific areas to understand how outcomes could be improved. We offer healthcare analytics templates that allow users to see what matters and take action without dependence on IT. So, whether you leverage our proprietary tool, Smart Medtrix™, or need custom support, we can help you move quickly from having data to celebrating results. The healthcare industry is already bustling with data and yet its data footprint is projected to grow exponentially in the coming years. This data explosion provides unprecedented opportunities to achieve data-driven healthcare management, but also presents the challenge of mining this abundance of data to uncover what is reliable and meaningful. The value of reporting and decision support solutions can easily be compromised by bad data: incomplete, inaccurate, and outdated information. This is the Garbage-In-Garbage-Out (GIGO) syndrome that plagues many healthcare initiatives. 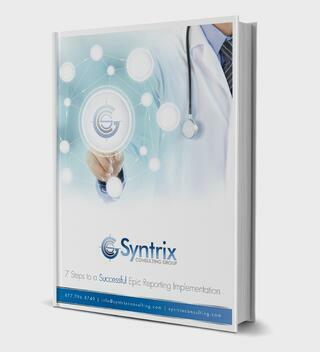 Syntrix offers data management programs designed to ensure data integrity in healthcare business intelligence solutions. Ensuring that healthcare data remain comprehensive, accurate, and current is not a function relegated to developers alone. It requires executive sponsorship and engages data users across multiple business and clinical functions. Furthermore, data governance is not a project that has an end point. It is an ongoing practice that must permeate the culture of your hospital or clinic. Syntrix's data governance process will help you engage all key parties and promote the importance of data quality throughout your organization. The performance of data analytic solutions often depends on the structure of their underlying data models. Our database administrators and business intelligence architects can help you devise optimal models to support your healthcare dashboard and business analytics solutions for the long term. Complying with regulatory data reporting or participating in pay-for-performance plans, such as the CMS' Accountable Care Organization Shared Savings program, requires the ability to securely deliver data to external agencies. Syntrix has a proven track record of success in building complex data extract packages and securely delivering files externally.